Keeper's Cottage in happier times. A remarkable picture supplied by Susan Marie Ward. This is another heads up for readers interested in local history, particularly of the Stonnall area. Julian Ward-Davies and fellow Stonnall historian Susan-Marie Ward have been busy compiling another great historical paper, this time about Keeper’s Cottage, the now crumbling, derelict house and barn on the bend of Footerley Lane, just before the hump bridge over the brook. Julian Ward-Davies of The Lost Lake of Stonnall fame last week published a great piece with Steve Hickman about master bricklayer Joseph William Taylor, and this new work now sits alongside all of Julian’s other great Stonnall papers. 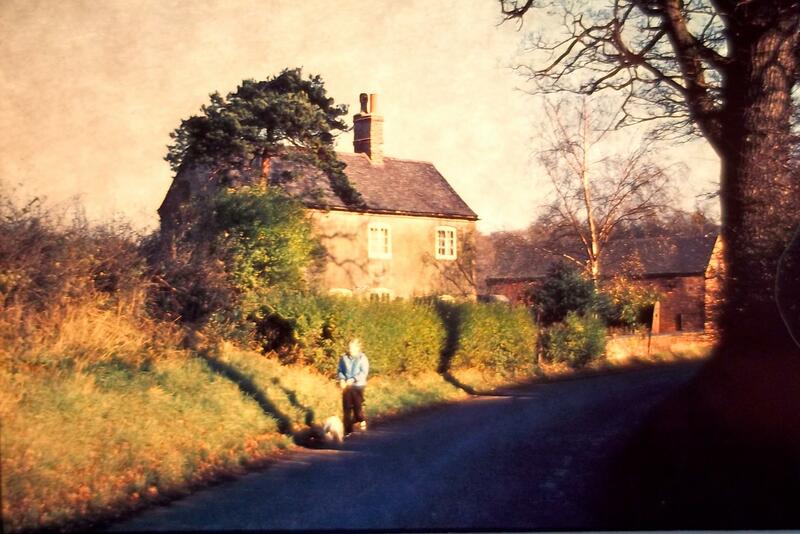 Keeper’s Cottage has been derelict for as long as I can remember – and that’s at least three decades, along with the cottages in Footherley itself and the lodge bungalow at Owlettts Farm. I despair at seeing what could be good homes being carried to dust when the landowner has been offered good money for them on multiple occasions. A tragedy in itself, that makes me very angry indeed. Click on the screen shot to visit Susan-Marie & Julian's great bit of research. This is just part of the fabulous work being undertaken by Julian Ward-Davies, Susan-Marie Ward, GordonMycock, Steve Hickman and the other stalwarts of the Stonnall Local History Group on Facebook. It’s an impressive thing and some real gems are coming out of this interesting and engaging project. It’s nice to see a community and group engaging with, and investigating, their shared community history. Please check it out. This entry was posted in Brownhills stuff, Followups, Fun stuff to see and do, Interesting photos, Local Blogs, Local History, Local media, News, Shared media, Shared memories, Social Media, Spotted whilst browsing the web and tagged Aldriidge, Brownhills stuff, Derelict, Facebook, Followups, Footherley, Fun stuff to see and do, Julian Ward-Davies, Keepers Cottage, Local History, Reader enquiries, Shared media, Shared memories, Social media, Stonnall, Stonnall Local History Group, Susan MArie Ward, Walsall community, Walsall Wood stuff. Bookmark the permalink. I’ve noticed recently (March 2012) that the trees and bushes have been cleared around row of derelict cottages in Footherley. I don’t know of any plans for these, and I can’t find any planning applications filed for them. My grandfather Alfred Ellison who owned the Footherley hall estate from about 1923 to 1946 I think sold it to the present owner. I can imagine him turning in his grave at the state of the place. What a waste. My Great Grand Father “George Henry Dalton” with my Great Grand Mother Mary Dalton I believe was the head of staff at Footherley Hall he lived in one of the cottages on the Estate and used to take my mother there to stay regularly. She tells me she also met your Grandfather Alfred on most occasions. I am looking for more information on my Great Grand Father and was wondering if you have any information you could share ?